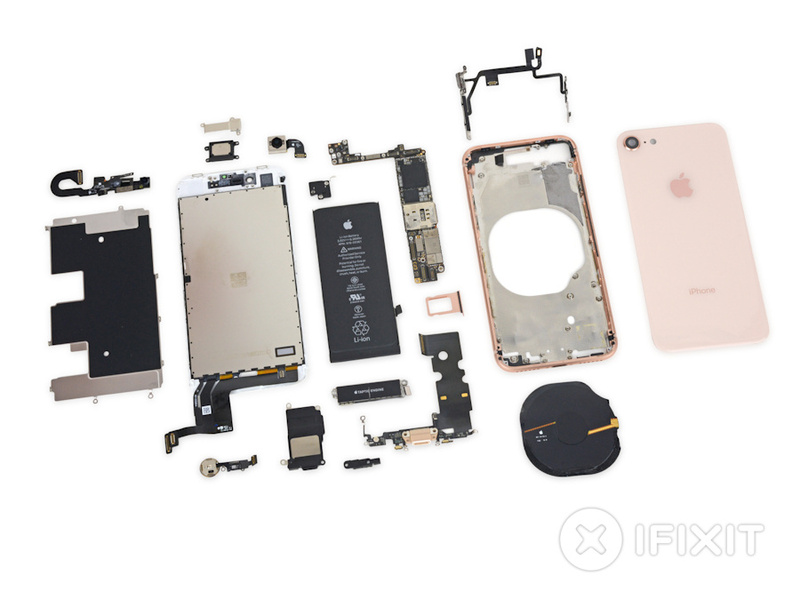 iFixit has long been the best source for detailed teardown information on smartphones and for giving a rating of how repairable they are. For the iPhone 8 release, they flew staff to Sydney, Australia, to get a start on taking the phone apart as early as they possibly could. The X-Ray test showed a similar internal design to the iPhone 7 with the key difference being a wireless charging coil in the middle of the phone. During the initial opening, they had to use a mixture of heat and prying tools to break the waterproofing seal and separate the top section from the main body (iPhone 8 is rated IP67). The screen and battery can be removed relatively easily by undoing some Phillips screws and detaching three cables for the screen, and four “stretch-release adhesive strips” for the battery. The battery capacity has been reduced from the 1960 mAh battery of the iPhone 7, down to an 1821 mAh unit on the iPhone 8. While both are tiny in comparison to flagship Android phones, such as the 3300 mAh LG V30, differences in how the operating system and software behaves helps to give similar battery life. 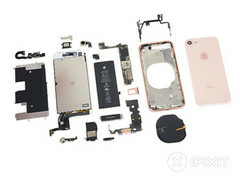 The Logic board, Taptic Engine, and speaker are now hidden under layers of brackets and cables making a more thorough disassembly necessary to switch them out, although once exposed they removed quickly. The teardown gets interesting when looking at how easily a user could replace the glass back if a fall were to break it. Unfortunately, they found it difficult to remove due to heavy use of glue, and during extraction, they deformed the backing plate. This indicates that an out-of-warranty repair for a cracked rear is likely to need still to be returned to Apple, likely at a higher repair price. iFixit say that they aren’t sure how Apple plans on replacing the glass rear during repairs. The key take-aways messages from the teardown were that the screen and battery are easy to replace, the other internal components require more complicated disassembly, and the glass rear is very difficult to replace. iFixit reinforce these points in their conclusion.